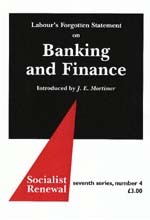 "In the discussion within the labour movement and the press about the current failings of the financial system, the 'credit crunch' and the consequential rise in unemployment little, if any, attention has been given to a statement entitled 'Banking and Finance', prepared by the National Executive Committee of the Labour Party and then presented to and accepted by the 1976 annual conference of the Party. The report saw the operation of Britain's financial system within the wider context of the problems of the economy. How right they were! At the heart of these problems was the need to increase industrial investment. This need, said the Labour Party report, was 'too important to be left to businessmen and financiers alone'. The report called for a doubling of the rate of manufacturing investment over the next decade. Manufacturing, it said, had 'grown anaemic and needed a major transformation' ... Unfortunately, the Labour Party's 1976 statement on 'Banking and Finance' was not adopted as a guide by New Labour when it was elected with an overwhelming majority in 1997. There is a lesson in this experience."